As I am sure the vast majority of you already know, picnik.com is shutting down shop in three short days. I have seen quite a few people in a bit of a dither over this, and I just wanted to offer my two cents on the topic. Actually, it's not even two cents, it's totally free. 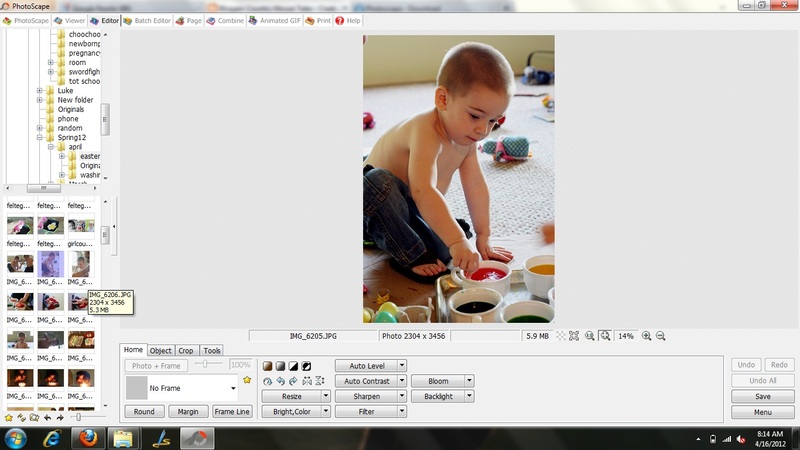 As in, a free photo-editing program that I've been using for about a year and absolutely loving. I will be the first to say that I am not a photographer, but I do like taking pretty pictures of my family, and sometimes those pictures need a bit of tweaking (sometimes they need a LOT of tweaking!). That's where Photoscape comes in handy. It is jam-packed with features, and...like I said...FREE. Here is a screen shot of it in use on my computer (and awww...Jack dying eggs). So, if you are looking for a nice photo-editing program, I would definitely recommend Photoscape! You can download it for free right here. Thanks Bekah! Much more affordable than buying something in the store :)!!!! my beef is that I can't find a program that has the features I want/need AND uploads straight to photobucket. blerg.